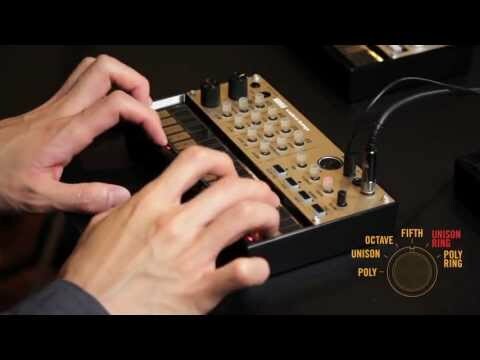 The new Korg Volcakeys follows on in perfect form from the monotron, monotribe and MS-20 mini. This is an ideal introductory synthesizer with a simple, yet powerful polyphonic sound engine and loop sequencer. The Volcakeys will deliver unlimited enjoyment with carefully selected parameters that let you create a diverse array of fat sounds that only analog synthesis can recreate. Creating new and versatile sounds is easy with the Volcakeys thanks to its three voice polyphony and voicing function. Simply turn the knob to choose any one of six combinations including poly, unison, octave, fifth, unison ring, or poly ring. When you have chosen your sound, add further sonic possibilities using delay for instantaneously spacey synth sounds. The delay effect also reproduces the pitch change that can occur when you change the delay time on an analog tape echo unit. The built in simple loop sequencer lets you record up to 16 steps in real time and overdub can be used to create complex loops that can't be played individually. Once you have your loop, store it in any one of the eight internal memory banks for recall. To add further character to your loops the motion sequence function lets you record knob movements letting you apply time-varying changes to your sound that will enhance your loops and add originality to your live performances. For extra dynamic playback, use the active step and flux functions to skip steps and play back without quantization producing distinctive grooves and irregular timings. One thing that won't be irregular is the tuning of the Volcakeys thanks to its built in self-tuning function, no more concerns over pitch drift that analog synths usually suffer from due to temperature changes or passage of time. The excellent connectivity on the Volcakeys allows for synchronized performance with multiple units or with your DAW via the SYNC jack and MIDI in port. You can also use the SyncKontrol iPhone app to wirelessly control tap tempo, swing settings, and synchronized playback with iOS music app via WIST. Top all these features off with the ability to power the Volcakeys from battery and a built in speaker and you can make music absolutely anywhere!